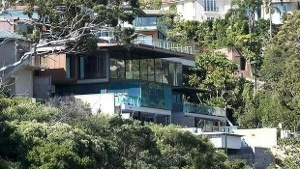 A new contender has emerged to knock Altona off its perch as Sydney’s most expensive house. Buyers from China have flown in to inspect the home, attracted by its extensive harbour views and the fact it is brand new. The palatial Vaucluse property on Gibsons Beach has an asking price of $60 million, and an offer of $50 million is believed to have been knocked back. The Point Piper mansion Altona sold for $54 million in May, setting a new residential record topped only by the 2009 sale of a Perth property for $57.5 million. Set over three levels with a lift, the hotel-sized property covers more than 2000 square metres. If a new record is set it would be all the more surprising because it is in Vaucluse, not the more expensive Point Piper, and it’s on waterfront reserve, not absolute waterfront, says buyer’s agent Simon Cohen, of CohenHandler. “It’s definitely a better house than Altona and it has better full-frontal views of the Harbour Bridge and city, but it doesn’t have the waterfront facilities of Altona,” he said. The property, believed to have cost more than $20 million to build, is owned by international bank consultant Andrew Ipkendanz, who bought what were two adjoining lots in 1997 for just over $6 million. 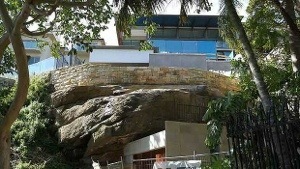 The property is believed to have cost more than $20 million to build. Ipkendanz, 53, is said to have planned to build his forever home on the site, but the former Scots College student now lives in London with his Brazilian wife, Mariana, from where he heads up Baiame Strategic Advisers. 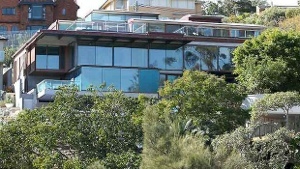 Sydney’s non-waterfront record was set in 2008 at $32.4 million for Craig-y-mor on Wolseley Road, Point Piper. In Vaucluse, a more comparable property is the beachfront property Tahiti, which sold for $29.25 million in 2007. Since scaffolding came down last month on the Carrara Road property, final finishes have been added and more buyers, predominantly from China, have inspected the house, designed by Peter Stutchbury. Set over three levels with a lift, the hotel-sized property covers more than 2000 square metres internally, including nine bedrooms, 10 bathrooms, office suite, parent’s suite, vast formal and informal living areas, self-contained guest quarters, rumpus room, games room, home theatre, municipal-style his and her change rooms, 20-metre swimming pool, boatshed, and garaging for five cars, all of which is finished by a mix of natural and industrial materials to create a funky factory aesthetic. “If there is competition among foreign buyers it will exceed the $54 million paid for Altona because this is new, the finishes are such high quality and it has that gun-barrel view,” says buyer’s agent Steve Smith, of SydneySlice.